You'll be £10.00 closer to your next £10.00 credit when you purchase London's Railways 1967 - 1977. What's this? This lovingly-produced pictorial book covers London's railways from 1967 to 1977, showing the transition from steam to diesel and electric traction. Accompanied by a very readable narrative, telling tales of the authors adventures during his many trips around the London railway network, the volume encapsulates a fascinating period of time in Britain. During these ten years a great deal of change took place, not only with railways and transport, but also socially and economically in the wider world. Jim Blake eloquently describes all of these changes, whilst also looking in detail at the capital's transport scene of the period. As seen in Buses magazine, this book really does offer a snapshot in time, and is a must read for all vintage railway and transport enthusiasts alike. Jim Blake was born at the end of 1947, and he soon developed a passionate interest in railways, buses and trolleybuses. In 1965, he bought a colour cine-camera, with which he captured what is now very rare footage of long-lost buses, trolleybuses and steam locomotives. These transport photographs have been published in various books and magazines. 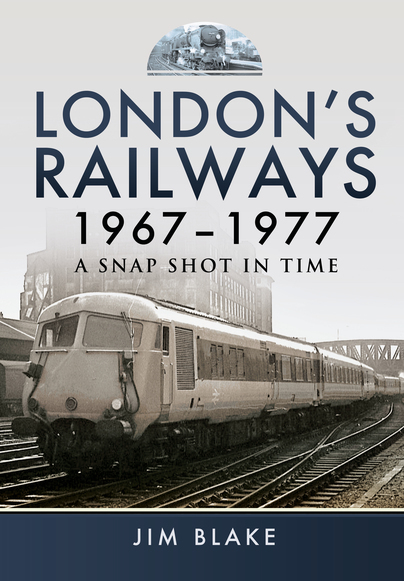 Jim also started the North London Transport Society and, in conjunction with the group, he has compiled and published a number of books on the subject since 1977, featuring many of the 100,000 or so transport photographs he has taken over the years.